But when it comes to how we value the DAM-worthiness of our assets, it appears we are split into two camps; the discerning auditors who handpick only the most important items to upload and save, and the asset custodians, faithfully storing everything and anything in the name of digital preservation. To establish which group is the more file savvy, it's important to answer one fundamental question; is it ok for us to be discarding assets? If we're using DAM space to hold duplicate or irrelevant content, then it seems sensible to say yes. Why waste storage space and risk system performance on files that we no longer need? However, with storage being affordable, and DAM offering the ability to archive items which may otherwise form clutter, there may not be a need to reach for the delete button so readily. In his article, 'Are you a digital asset hoarder or a digital curator? ', Ian Matzen argues that the overseeing of Digital Asset Management systems should prompt careful consideration as to what to keep, and what to throw in the digital trash can; "For collection development to succeed there needs to be a policy, also known as a retention policy, drawn up by your governance committee and then ratified by stakeholders. It should define, as specifically as possible, the asset types that get stored and managed, how long they are kept, and what gets tossed, such as duplicate, ephemeral, or low value assets. The committee should review this policy regularly and make any necessary changes, adding new asset types or judging whether different criteria should be introduced to help curate the best possible collection of digital content for your users." In short, Digital Asset Management should organically lead to collection management. For some, the mere ability to fill an expansive DAM system with a vast wealth of content will prove irresistible. For others, the appeal of Digital Asset Management will be in hosting a streamlined, targeted and highly organised library. 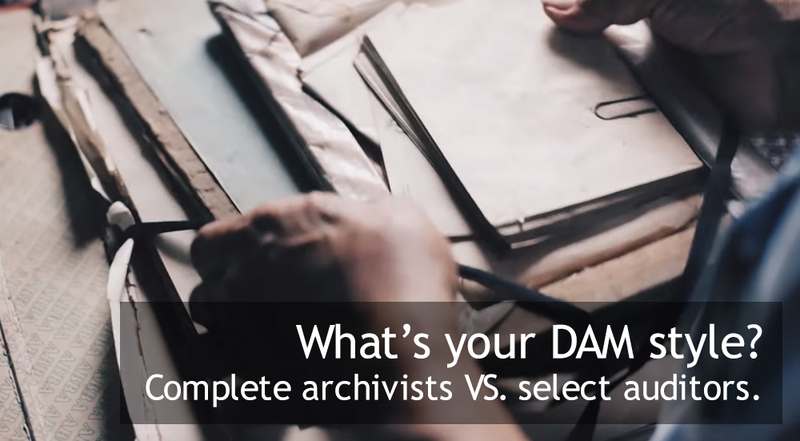 So ResourceSpace asks you, are you an all-inclusive archivist, or a highly selective auditor? Ian Matzen is a Digital Asset Management professional with a graduate degree in Library and Information Science. His current job includes managing rich media for a publishing company. The subjects he studies and writes about include metadata, media management and digital preservation. His professional experience in post-production for commercials, episodic television and corporate videos in Los Angeles and San Francisco informs his work.